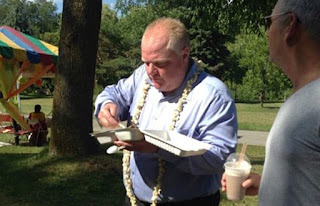 When Mayor Rob Ford Chanted "Hare Krishna" ~ The Toronto Hare Krishna Temple! When Mayor Rob Ford Chanted "Hare Krishna"
With recent news of the tragic passing of former Mayor of Toronto, Rob Ford, many devotees of Toronto's Hare Krishna Community have been fondly recalling how the then-Mayor visited our annual Festival of India (Ratha-Yatra) in 2014. It was the second day of our grand two-day annual event on Centre Island and word quickly got around that the Mayor had arrived at the festival site. He first visited the Deity booth, diligently removed his shoes and then took darshan (audience) of Lord Jagannatha (Lord Krishna). He was then garlanded by one of our pujaris (priests). Mayor Ford was then brought to the main stage where he shared a proclamation from the City of Toronto, honouring our annual Festival of India (Ratha-Yatra). The highlight was the Mayor enthusiastically yelling out to the crowd, "Hare Krishna!" and receiving a jubilant "Hare Krishna" back as seen at the end of the video below! Mayor Ford then toured the rest of the festival site, indulged in some prasadam (sanctified vegetarian food) and shook hands with what seemed to be an endless throng of people! Toronto's Hare Krishna community extends our prayers and condolences to the members of the Ford family during this difficult time. We hope that those who are mourning the loss of Rob Ford can take solace in knowing that he most certainly received great spiritual benefit by chanting the words "Hare Krishna" with all of his heart.